If you could be best friends with one of your Mason Dixon characters, who would it be? Foster. Larry, clearly, haha. Who wouldn’t want to visit a giant farm full of cryptids? How would you describe your new Mason Dixon series? Mason is an animal lover at heart, even when said animals want to eat him, and that provides a dynamic I really enjoy writing. He does everything he can to save the cryptids he’s hunting, and relocates them whenever possible. Sometimes they’re too far gone, or too immediate a threat, but he takes no pleasure in putting anything, or anyone, down. I recently finished Refuge of Dragons by Carrie Vaughn. It’s the long-awaited sequel to Voices of Dragons (one of my favorite books ever) and is a wonderful sequel. Sometimes when you have to wait several years for a follow-up, there’s just no way it can live up to the original. Not the case here. Refuge is a masterful sequel that should not be missed. I’m allergic to just about every kind of animal imaginable, so instead I have a Worrible. And I occasionally give Worribles away when they multiply too fast. What was your playlist while you were writing Mason Dixon: Monster Hunter? Sometimes when I’m writing the Vesik urban fantasy series, I really enjoy writing to heavy music with vocals. 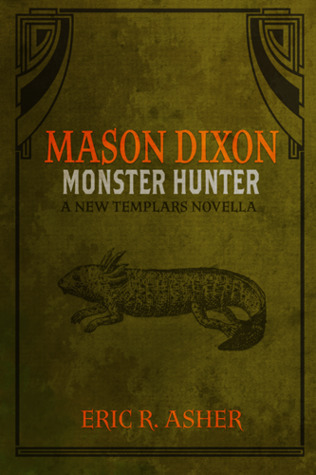 It’s great for that undercurrent of violence and mayhem, but I wanted something more subtle with Mason Dixon: Monster Hunter. My main listens were primarily instrumental and soundtracks.